For some parishioners of St. Matthew in Northwood, the April 2 slaughter of at least 147 students at a Kenyan university is much worse than another piece of terrible news from the other side of the world. “It took us by shock,” said Dionisiah Mwaura, 62, an active member of the community of Kenyans that have made St. Matthew their spiritual home. “It’s very, very bad, because these were young people we had hopes for,” she added. Festooned with the flags of its parishioners’ 45 nations of origin, St. Matthew welcomes many from African countries, including Nigeria, Sudan and Kenya. Father Joseph Muth, the pastor, said that his Kenyan parishioners were reeling the weekend after the al-Shabab terrorist attack, which targeted Christians. “You could tell they were disturbed and looking to do something,” Father Muth said. On April 10 at 7:30 p.m., St. Matthew will hold a special Mass to pray for Kenya during this time of crisis. The Mass will feature a performance by Wasafiri Voices, a group that formed at St. Matthew to promote Kenyan culture and Christian faith through music and dance. Father Muth said that he has also asked Malaika Wanjihia, a Mercy High School student and member of the St. Matthew Kenyan community, to write a poem or essay to share after his homily. Mwaura said that some parishioners have personal ties to the students killed by al-Shabab gunmen. 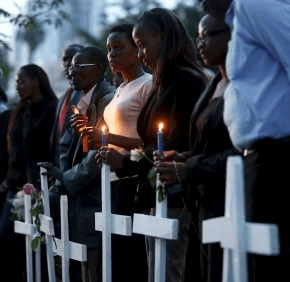 The bishops also urged citizens to be vigilant and report suspicious behaviors, and called for an emergency response strategy to be implemented across Kenya to minimize casualties in future attacks. St. Matthew has long been integral to the local Kenyan community. In 2008, the parish hosted Cardinal John Njue, archbishop of Nairobi and chair of the Kenya Conference of Catholic Bishops, for an eight-day visit.